OK you Z'ers I've been using this way of posting my pictures or any other picture I've found, without downloading it first and then uploading to a hosting site like PhotoBucket or Flickr etc. I'll show you how..... and it's only few simple mouse clicks to get your picture posted. Now I have tried this from magazine articles, google images, general pictures found while browsing etc. Works on all the ones I've tried. 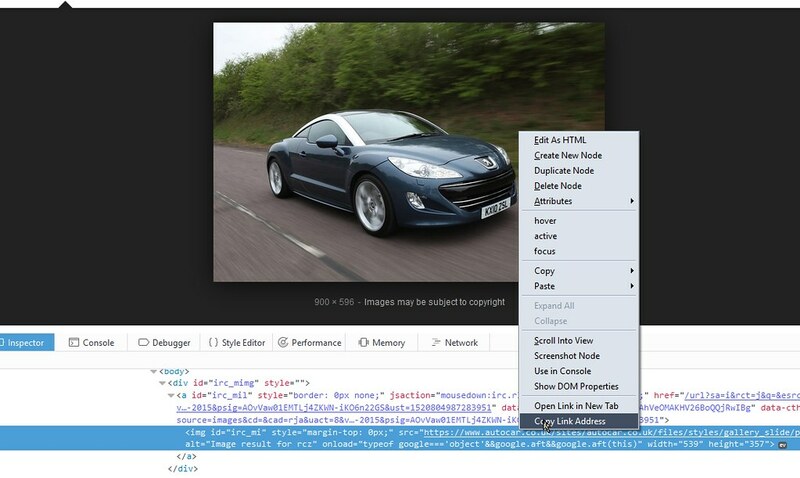 Try this - goto google images - type rcz, enter. 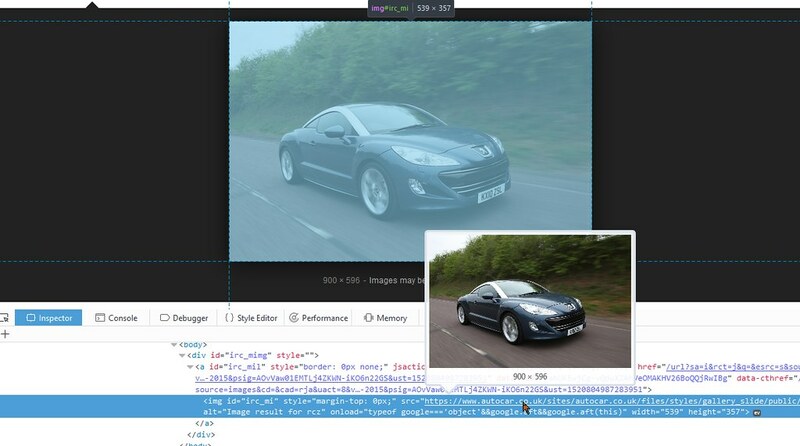 Now right click on the picture and click " inspect element "
Now we are almost done and the picture is copied ready for pasting into your forum post which you are creating. Follow the below 1.2.3.
click on Img then right click between the two img boxes and paste, now preview just to check it's showing correctly. Done !!! of course you can upload pictures or even use the attach but the attach has a limit of 5 pictures. When you add pictures this way - you are not hosting from a site just linking the address, and you will see a + in the top left of picture once posted, this enlarges the picture . 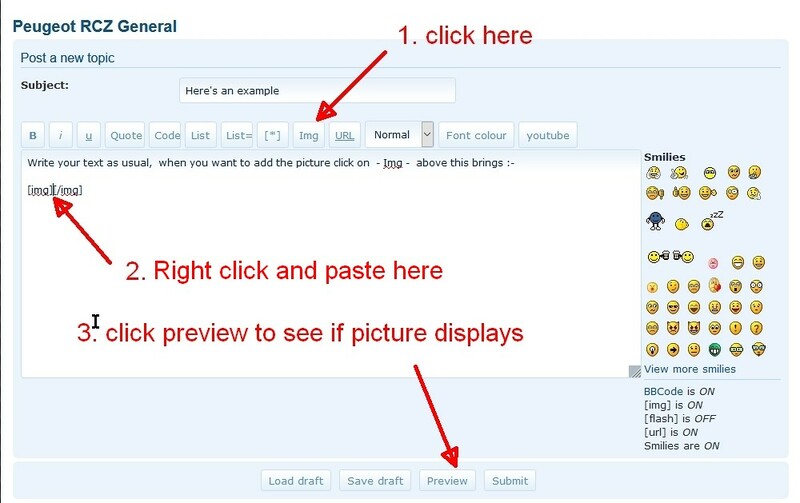 For the purpose of this guide I used attach and this method, only because of the attachment limit of 5 pictures..
From right clicking and choosing " inspect element " to the bottom of guide is how you do it on a picture found whilst browsing. Anyway you try it next time, much easier than downloading to phone or pc then uploading to one drive or photobucket etc then linking from there. I don't trust any of those sites with my photos and keep everything on the 14TB that I have backed up. I only used photobucket for posting on this forum, security is key for me, don't want to lose my data or have anyone else access to it be it a hacker or a system administrator. Believe me - they can and some will, I want my data private, I'll share it if I want but only then. Sounds Puuurrrrrrrrfect to me.......... zzzzzzzzzzzzzz !!!!!!! Perhaps you should have bought a Jaguar??? Last edited by DKZ5745 on Wed Mar 14, 2018 11:26 pm, edited 1 time in total.